It's nearly a foot longer than an already-big luxury sedan. Think the Genesis G90 is big? Well it is: at over 204 inches from bow to stern, it's longer than the standard-wheelbase versions of the Mercedes-Benz S-Class or BMW 7 Series (sold overseas), and nearly as long as their respective extended versions (that we get in the US). But this one is even bigger. 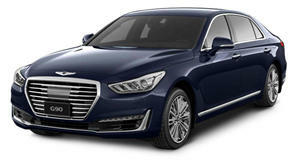 Unveiled in its native South Korea, Genesis has stretched the new G90 Limousine by almost an extra foot to take up 216 inches of parking space. That's even longer than the Maybach S-Class (though not quite as long as the 21-foot Pullman limousine). The 11.4 inches of extra space is dedicated, of course, to the rear seating area, and is divided between the widened B-pillar (nearly ten inches) and the bigger back doors (1.6 inches) to make it that much easier to get in and out. It's a bit taller as well, with a roof raised by a third of an inch. Once seated, the senior execs at LG and Samsung who'll likely be buying the new Genesis limo will find first-class recliners upholstered in semi-aniline quilted leather and adjustable 18 ways, with plenty of room to stretch out. Otherwise it's basically the same as the standard G90, which is no bad thing – especially since it's recent facelift. Power comes from the same 5.0-liter V8 that powers the top version of the standard-wheelbase model, rated at 419 horsepower and 383 lb-ft of torque and mated to an eight-speed automatic transmission. It'll be available to order in its domestic market for KRW 155.1 million, or about $138k at current exchange rates. Don't bother asking for it at your local Genesis dealer though, because as long as it is, we don't expect it to stretch all the way across the Pacific. Hyundai follows in the footsteps of Lexus, but will it work?